Grant Kimberley checks soybean plants on his farm, Sept. 2, 2016, near Maxwell, Iowa. Chinese officials say the U.S. trade deficit with China is the result of U.S. trade policy. Chinese officials note that the U.S. bars the export of many high-technology products. Chinese Foreign Ministry spokeswoman Hua Chunying said the products traded have unequal values. U.S. agriculture exports to China are almost $20 billion. Most of that number is shipments of soybean. If China were to target soybeans, it would hurt farm states like Iowa, the home state of U.S. Ambassador to China, Terry Branstad. Boeing has said it expects China to buy aircraft worth $1.1 trillion by 2036. But China is also developing its own C919 passenger plane. The Chinese foreign ministry added that it hopes to hold useful talks with the U.S. Hua said the goal is to reach what she called “a win-win solution” to settle trade issues. 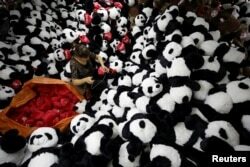 A worker processes panda soft toys for export to American and European markets at a factory in Lianyungang, Jiangsu province, China, October 9, 2017. American businesses, including Walmart, Apple and other technology companies, also oppose a trade war. Forty-five American trade associations warned that tariffs will raise the price of goods for Americans, hurt jobs and financial markets. Scott Kennedy is with the Centers for Strategic and International Studies in Washington. He told VOA, over the short-term, that is true. But, if such a policy could get China to reduce its barriers to trade, American buyers and businesses would gain while increased trade would also be good for China. Trump said Thursday’s action would be “one of many.” The U.S. recently placed tariffs of 25 percent on steel and 10 percent on aluminum imports. Some countries, including Canada and Mexico, are not subject to the new taxes. Steve Herman reported this story for VOA News. Mario Ritter adapted it for VOA Learning English with additional AP and Reuters material. Hai Do was the editor.